TATS A KOOL CHALLENGE: I Won...... again! Yup that's right, little ol' Tatskool's luck has changed! 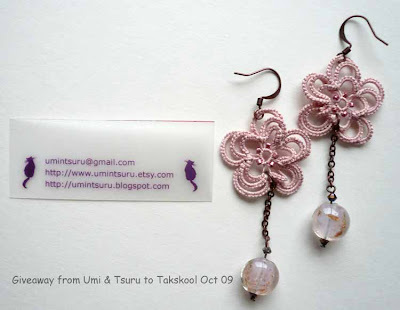 This time the giveaway was by Umi And Tsuru, if you haven't visited her blog go there NOW. She is a very talented lass. Well after a long wait...seemed like years but was only a few days...an envelope was waiting for me in my porch...didn't even have to watch for the postman! 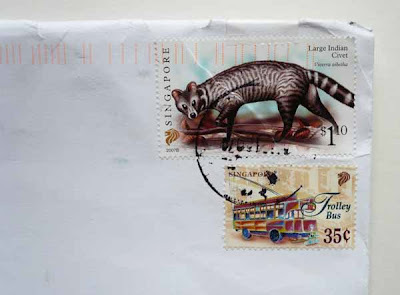 ...look at those lovely stamps.. all the way from Singapore..oh my what happy memories that envelope brought back. I have been to Singapore twice and it's a great place to visit, so much to see and do....last time we went on a boat down the river, we hadn't even seen the river the first time we went....too much to see in Orchard Road! My very, very favourite memory is of the night safari, this was just the BEST! .....now isn't that a tempting little package...shall I rip it open...carefully!!.. The flowers (27mm across) are tatted in dusty pink Flora 20 cotton thread (#237) with metallic pink Delica beads from Japan. 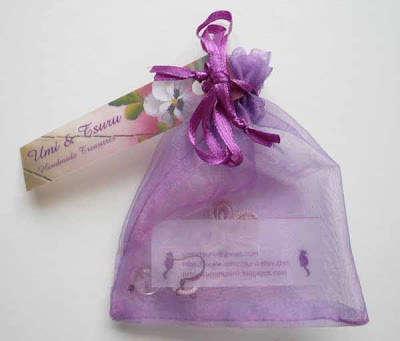 A pink glass bead with gold flakes (12mm) with bronze bicone Swarovski crystals (3mm) hang from the tatted flower. Ear hooks and findings are bronze-toned. Length approx. 7.8cm / 3.1inch including ear hook. ...the weight of the large bead makes them hang beautifully. Thank you so much...isn't life fun! I went to her etsy shop but the cupboard was bare...she must have sold out...no wonder. Oh and BTW I dyed more Antique Bronze since so many of you said it was good. I had only dyed that little 10yd sample and written down the recipe but it was WRONG!! I should have done another sample to be sure....it was much too dark brown at one end and too pale at the other. The charm of this thread is it's subtlety...that word again! can't believe that chocolate and lime could have given this thread with only a hint of it's green ancestry! So it was back to Dyeskool again.The result...dull but with a je n'e sais quoi sheen! Oh and PS.....I just won another giveaway....not fair is it!...but, but had I waited so longgggggggggggg.....and I am worth it! Oh! and I forgot to tell you that the very day the envelope arrived another gift fron Singapore arrived home......mangosteens from a friend. Have you ever tasted mangosteens??? Oh my if that isn't ecstacy..what is!!!! Well except "a glass full of tea and a tatting shuttle filled with Hand Dyed Thread"
You are one lucky lady! The earrings are beautiful! Oh, how I wish I could wear earrings. Mangosteens... I'll have to follow your link to find out what they are... baby mangos? Congratulations on both your wins! Congratulation Pamela!! The earrings are so pretty!!! Your photos look great. Oh dear, I should have used a much prettier bubble wrap. Glad you liked it. Happy to know you have visited Singapore. Hopefully one day, I get a hcance to see Ireland. I have only been to the night safari once. Okay I'm off to get myself some of your HDTs. Hello, Pam! Long time, no chat. Ooh, pretty! Congrats on your win. 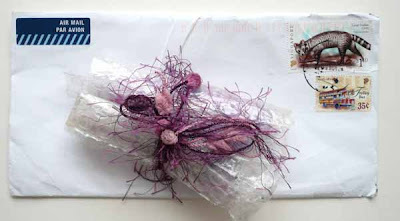 The packaging and the postage stamps are almost as lovely as the earrings! You are having a lucky streak! - enjoy it. I've won a giveaway too, which is almost incredible - a "runner up" prize from Lady Shuttlemaker. I can't wait to see what it is, she says it will be a surprise. Ooo, I LOVE mangosteens. Grew up with them in Malaya, for breakfast every morning when they were in season. Almost every variety of tropical fruit is here in Brisbane, but I have never seen mangosteens. Perhaps they grow in the Far North, I must ask my son. Grandbaby's First Birthday and nearing Halloween! A person can never have too many books!! Giveaways Galore...oh and an Award.